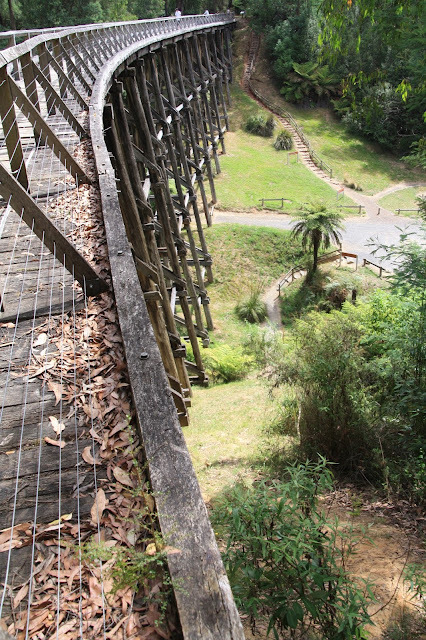 A very short drive from town, or a nice flat walk/ride along 2km Rail Trail, is the Noojee Trestle Bridge. The historical bridge served the local area from the early 1900's until the railway line closed in the 50's. Bushfires have blazed their way through the area a number of times and the bridge was destroyed and rebuilt. The massive expanse is 102m long and 20m high and is worth a visit for the treetop views and fresh mountain air. A short steep track up one side and down the other allows access to the bridge from the car park. We drove on this occasion, but I'll definitely do the Rail Trail next time.